Home / top list / What are the Companies which provide Best Hosting Services under $4? What are the Companies which provide Best Hosting Services under $4? Like everybody, who are in need of hosting and are not able to decide which one to choose from, I was also spending hours on google searching for the hosting that suits my website and that can be further relied on, in future. There are too many hosting service providers in the market but your decision on selecting one for your website should not be based merely on their popularity. Therefore I have compiled everything you need to know before you decide upon any web host. 1. Analyse how much disk space and bandwidth is needed for your website, for example, if your website content is more of videos and graphics then you require a good amount of bandwidth and disk space. 2. If your website is getting plenty of traffic and there are dozens of pages on your website then also you are going to need a lot of bandwidth and disk space. 3. Another important issue you must look up to is the security features. Things like firewalls, daily backups and user authentication should be enclosed. 4. There should a prompt customer support service which provides 24x7 assistance and also has many ways to induce the support like the reliable web hosts would provide support through email, phone and online chat. 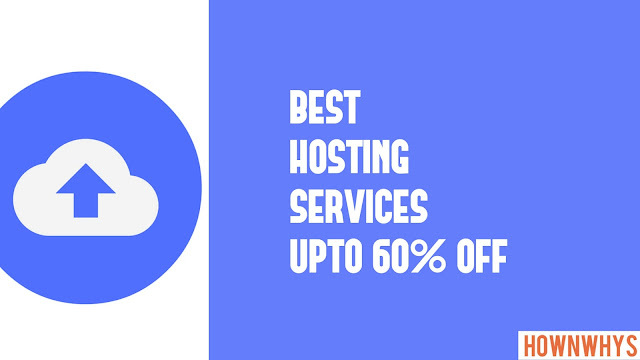 It is undoubtedly the most considered factor while deciding on web hosting and it should be because there is a wide range of hosting packages carrying different price tags. If you want an affordable provider with cent-percent reliability then you must make sure that their support department is in-house. You need to ensure that you get the best returns on your investment here. You must make sure that the web hosting service you are choosing today is a one which can be relied on in future too. Choose the plans accordingly, keeping in mind your future plans. The web hosts generally provide you with an extra discount if you buy some plan for more than one year, therefore, your decision should not be based on that discount, if you have some bigger plans for your website in future. Popularity: We have selected sites which are most promoted and used by top bloggers like ShoutMeLoud, BloggersIdeas, Bloggertipstricks. Affordability: We have made sure that all the web hosts in this list are affordable and at the same time effective enough to meet your requirements. Dependability: Well I would say no host is 100% ideal here. But the chosen ones are all rated 4 stars and above. Customer Support: Since this is a very important attribute of any web host and it affects your decision to a great extent, the list here includes all in-house support system sites which have 24x7 customer support. Again I want to remind you choosing the best web host for yourself is a decision you must make only after analysing every aspect and making a list of what you want from your web hosting provider. How to add social media icons in Blogger? Blue Host is one of the largest web hosting companies in the world. It was started in 1996 and grown to be one of the top hosting companies and provide lots of features and easy to use tools for its clients. Hostgator was started in 2002 and later it was acquired by a group which also owns Bluehost. It is particularly famous for its uptime, which they proudly claim to be 99.99%. It is very user-friendly for beginners. They have endless tutorials, FAQ pages and explanations to help you at every turn. Another one of the top hosting site which provides reliable and affordable hosting. They have a strong support system which is always prompt to help their clients. All above-mentioned prices are accurate as mentioned on their respective websites, on the date of publishing of this article. Choosing a web host is an important decision as web hosting is required to make your site accessible through the internet, therefore you must take it seriously and choose wisely. Which web hosting service are you currently using? Share with us your reviews or feedbacks regarding these or any other web hosts you are currently associated with. Your feedback is definitely valuable for those who are still looking.